More than just a ride, I’m talking about Paris-Brest-Paris 2019. The date is 18-22 August 2019, and by now your preparation should be well and truly underway, if not on the home straight. Everything you need to know is here, so head over and check it out. Only slightly less epic than PBP, the The Fleche Opperman All Day Trial (or “The Oppy”), a 24-hour team time trial held annually by Audax Australia. The Oppy is an event for teams of three to five bicycles. Each team must ride at least 360 km (you design your own route) in 24 hours. If you’re not up for 24 hours of riding, try the Petit Oppy (180 km in 14 hours). In 2019 in SEQ the Oppy will start at 8:00 am Saturday 23rd March; and finish 24 hrs later. In FNQ the Oppy will start on a different date: 8:00am 18th May. Is next year the year to get two Oppy Medallions? For those contemplating their 2019 campaign, information has been provided on the website here. Heath Carney had a big night out on the midnight century. Read about it here. There are a number of first hand PBP reports from those who have attended in the past. These remain a good read and are available here. Thinking about your 2019 Oppy? The 2018 Oppy was well subscribed with teams aspiring to break records or just get the job done while having an awesome time. You can read about four different approaches below. 2018 has seen a lot of effort invested by the national committee to improve the running of the organisation with focus on simplification of operations and uniform process. Key to this has been leveraging technology where it makes sense to do so. An example is the ride registration system used in Queensland now for some time, and which will be adopted nationally. Financial management has been overhauled, again to provide a uniform approach, but the effect is to drastically reduce the workload on state treasurers. The newsletter distribution is automated making the job a lot easier for the various newsletter coordinators by providing a simplified mechanism for communicating with the Audax membership. An overhaul of the Audax website is underway as well. 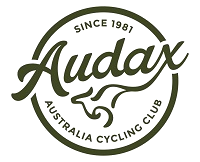 The working party have developed a framework which will serve the national Audax community well into the future, and I can’t wait to hear more about it. I’ve seen the early work, and it looks great. There has been a lot more work done on our behalf, too much to report here even in passing. I think its worth noting, to ensure these efforts receive recognition, rather than flying under the radar. We are seeking a volunteer to take on the Treasurers role in the new year. This role is not onerous and keeps the wheels moving. Please contact Brian Hornby (0418 711 417) or Kym Raffelt (0431 471 839) if you can help. I will be regrettably unable to continue to compile the newsletters in the new year. Once again this is not an onerous task so please contact me (0434 600 085) if you would like more information. New Route for 2019! Ride all 11 bike permitted bridges across the Brisbane River. This ride follows along the river with a couple of small climbs. A great way to shake off the 2018 cobwebs, complete with a nice shady spot for the checkpoint across from the Uni. Now with a finishers’ sausage sizzle! A gallop (or leisurely trot) across rail trail,backroads, road reserves and a bit of black stuff. Starting and finishing at the Tolga Pub, this scenic route visits some favourite sights on the Tablelands, as well as some bits you never knew existed.